Stride (Released when both players' vanguards are grade 3 or greater! 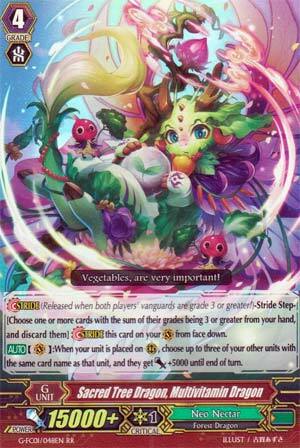 )-Stride Step-[Choose one or more cards with the sum of their grades being 3 or greater from your hand, and discard them] Stride this card on your (VC) from face down. [AUTO](VC):When your unit is placed on (RC), choose up to three of your other units with the same card name as that unit, and they get [Power]+5000 until end of turn. Another option for Neo Nectar Strides if you don't like Primavera (I don't blame you if you do). Multivitamin Dragon is basically Jingle Flower-Lite. Every time you call a rear-guard, up to 3 OTHER units with the same name gain 5k until the end of the turn. So this is basically support for the on-boost clone-er for Neo Nectar for a sudden boost in power. It's more often than not going to be restricted to one column unless you chain calls together with stuff like Ahsha, but that's dependent on a poor field, so don't go too nuts with the idea. But if you reckon your field's big enough not to warrant Arborea, this is a neat way to push for damage with big columns. Options is nice and at least it means not requiring 3-4 Arborea. Still not sold on the field dependency thing but it's not bad I suppose. ...What's with Dragons having to say that they're Dragon's twice? That's like going "Hi, my name is Hugh Man and I'm a Human." Just, Department of Redundancy Department. Anyway, when it's on V and you call a unit to R, choose up to three other copies of that unit and give them +5000 each. Really good in Musketeers, not sure about G-era Neo Nectars, haven't seen much good from them yet.